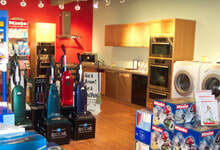 North Shore Vacuum and Appliance provides expert vacuum repairs Marblehead MA area customers can rely on. We offer vacuum repairs on virtually all major brands and styles of machine so that even if you didn't purchase your vacuum here, you can trust us to fix the problem. Our shop carries a wide variety of vacuums, appliances and hard-to-find parts, which means more often than not, we have the parts you need when you need them; no waiting! We offer generous store hours for your convenience, including staying open Saturdays and late on Tuesdays. For a free estimate on vacuum repairs, call ahead at (781) 595-1455. Or bring your machine into our store Monday-Friday, any time from 9 a.m. to 6 p.m., or until 8 p.m. on Tuesdays, and someone should be available to help you. On Saturdays, we are open from 9 a.m. to 4 p.m. Residents of greater Marblehead MA may also email us for more information at wsims@msn.com. Run by a fourth-generation owner, North Shore Vacuum and Appliance is fueled by decades of experience providing residential and commercial vacuum repairs. That's why, when it comes to vacuum repairs, Marblehead MA area residents choose us.